Environmentalists continue to claim that antimicrobial silver used in consumer goods and products such as colloidal silver pose an imminent threat to the environment, and must be banned before they cause an ecological catastrophe that could wipe out numerous forms of life. Yet the governments of the world – with the United States leading the pack – have been routinely spraying the environment with literally TONS of silver for nearly six decades, in their ongoing cloud-seeding programs. And you don’t hear a howl of protest from the environmental crowd over this relatively humungous amount of silver that’s been entering the environment for nearly 60 years. Why not? Could it be because there’s been no documented harm whatsoever to wildlife or the environment from the silver being sprayed into the atmosphere which in turn falls back to the very earth it originally came from? According to The Silver Institute Newsletter (May 2016), during the recent California drought, Los Angeles government officials admitted they ran a cloud-seeding program that produced an estimated 15% more rainfall during the month of March, 2016. In cloud-seeding, billions of silver iodide particles are sprayed into the clouds either from the air or from a ground-based system that shoots silver iodide vapor up into the clouds. Water vapor then freezes on the tiny, air-borne silver iodide particles, which produces rain drops. And the rain drops bring the silver iodide particles back to the ground. The U.S. government has been indiscriminately spraying silver iodide -- a combination of silver nitrate and potassium iodide -- over the country since the 1960's (and even before) in cloud-seeding programs designed to increase rainfall. Yet you never hear the radical anti-silver environmentalists complaining about the massive amounts of silver being dumped directly into the environment during the course of cloud-seeding programs of the past nearly 60 years. For example, according to George Bomar, manager of the Texas Weather Modification Program, of the Texas Department of Licensing and Regulation, during drought-stricken times such as those experienced over the past few years, cloud-seeding programs utilizing silver iodide are flown up to a dozen times a month. What's more, more than 50 other nations worldwide have instituted weather modification programs that use silver iodide and salt-related chemicals for cloud-seeding programs, resulting in literally millions of silver iodide cloud-seeding operations since the 1960’s. In fact, cloud-seeding actually started back in the late 1940’s when Dr. Bernard Vonnegut (brother of the late science fiction author Kurt Vonnegut, Jr.) first discovered how effective silver iodide is when used as an ice-forming nucei in clouds. Since that time, the process has been gradually perfected. And weather modification companies like Atmospherics, Inc., North American Weather Consultants, Inc., and Weather Modification Incorporated, which specialize in cloud-seeding programs, are hired by governments to conduct cloud-seeding operations. Here in the United States, these programs are often administered by the various utility companies and paid for – usually, unknowingly -- by you and I, the consumers, through “public purpose program surcharges” on our utility bills. Cloud-seeding experts say that in spite of literally millions of silver iodide cloud-seeding operations undertaken since the 1960’s when governments began using the technology more frequently, the silver iodide disperses over such a wide area it has no significant negative effects on the environment. Indeed, a 2013 study by Swiss scientists found that upon being returned to the environment, tiny, man-made silver particles such as those found in commercial products (such as antimicrobial clothing, food storage containers or computer keyboards) are “rendered inactive” thanks to silver’s natural tendency to bond with other elements in the environment such as salts and sulphur. (See also, “Nanosilver – Nothing New, and Not Harmful to the Environment in Over 120 Years of Use!”)Experts say the same is true for the silver used in cloud-seeding operations. It simply returns to the environment where it's sequestered by other elements and returned to its natural state. Meanwhile, the radical anti-silver environmentalists continue to scream bloody murder over the supposed "dangers" of the use of antimicrobial silver in consumer products, such as socks, shirts, sheets, food storage containers, computer keyboards and yes, even liquid colloidal silver products. They now claim – breathlessly -- that because of the widespread use of antimicrobial silver in consumer products, silver residue is now being found throughout the environment – even in remote areas of the world -- and as such poses an imminent threat to microbial life forms that the environment depends upon. Of course, what the environmentalists are actually finding are not silver nanoparticles from consumer products, but instead, remnant silver particles from cloud-seeding operations that are carried on the winds to remote areas. But even if the environmentalists were indeed finding silver nanoparticles from consumer products in the environment, it’s still a moot issue. After all, as I’ve pointed out many times before, “Mother Nature” knows how to sequester and neutralize active silver particles by bonding them to other substances such as salts, sulfur compounds and more. The silver particles then become inert, gradually reverting to harmless elemental silver which, of course, has been part of the environment since the dawn of time. But – and this is quite interesting -- “Mother Nature” can also reverse the process as well, creating brand new active silver particles from inert elemental silver. And these active silver particles, in turn, once again bond to salts, sulfur compounds and other substances in the environment, gradually reverting back to inert and harmless elemental silver. In other words, it’s an ongoing process – what you might call a “circle of life” of silver nanoparticles -- and it’s been taking place in the environment, over and over again, quite literally since the dawn of time. Yes, earth has been manufacturing its own silver nanoparticles – quite prolifically -- for eons, with no harm to the environment whatsoever. This is what the radical, anti-silver environmentalists don’t want you to know as they spread their fear-mongering campaigns against the use of silver nanoparticles in consumer goods and colloidal silver products to the gullible public (see Environmentalists Claim Silver Usage Is “Killing the Planet”). They try desperately to frighten people into supporting their much-wanted ban on the use of antimicrobial silver in consumer goods such as clothing, food storage containers, computer keyboards, and more. Well, silver has already been in the environment for eons. Even the world’s oceans contain millions of tons of trace silver, yet they’re teaming with abundant life, both plant and animal alike. And finally, as we’ve seen in this article, the governments of the world have been spraying tons of silver into the atmosphere for nearly 60 years now, with no documented harm to the environment whatsoever. Owning a high-quality colloidal silver generator is the only way to guarantee you’ll have access to infection-fighting antimicrobial silver should the radical environmentalists eventually get colloidal silver banned, as they continue to try to do. 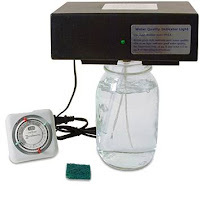 A Micro-Particle Colloidal Silver Generator from The Silver Edge allows you to make your own high-quality colloidal silver for less than 36 cents a quart. Compare that to major health food store brands which usually cost between $20 and $30 for a tiny, four-ounce bottle, and you’ll see that the savings are astonishing. In fact, compared to health food store prices for colloidal silver, your very first one-quart batch of micro-particle colloidal silver actually pays for the entire cost the generator. Do you know of any other health product that literally pays for itself the very first time you use it? Obviously, having the ability to make your own high-quality micro-particle colloidal silver for only pennies per quart is about as close as you’ll ever get to having "free" colloidal silver for the rest of your life, any time you or a family member, friend or loved one needs it. And because the silver particles produced by this amazing breakthrough in colloidal silver-making technology are as low as .8 nm – a fraction of a single nanometer – their effectiveness against colonies of pathogenic microbes is astonishing. Because of their extremely small size, the tiny, submicroscopic silver particles are up to 1,000 times more bioavailable than conventional silver particles. This means the human body is able to absorb 99-100% of the silver, send it throughout the body to kill pathogens, and then excrete it with ease, afterwards. Plus, it’s now known that these tiny silver micro-particles are able to kill off entire colonies of pathogens with far greater effectiveness than conventional colloidal silver particles, because of the “zombie effect” described in this recent article about brand new research out of Hebrew University in Jerusalem. Perhaps that’s why so many thousands upon thousands of people absolutely rave over the effectiveness of their homemade micro-particle colloidal silver, as you can see at this web page full of real-life colloidal silver success stories. Read how unbelievably simple it is to make your own high-quality colloidal silver for less than 36 cents a quart, here. Learn why the Micro-Particle Colloidal Silver Generator is the world’s #1 best-selling colloidal silver generator, here. Find out how to save a whopping $100 on a brand new Micro-Particle Colloidal Silver Generator, here. Meanwhile, I’ll be back next week with another great article on colloidal silver…. Copyright 2016 | Life & Health Research Group, LLC | PO Box 1239 | Peoria AZ 85380-1239 | All rights reserved.